Indiana Maps from Omnimap, the leading international map store. Indiana US Forest Service Maps. Indiana Atlas and Gazetteer. 1:156,000. DeLorme. Excellent road atlas with topographic maps and gazetteer. Softcover, paper. Indiana Road Map. Rand McNally. Rand McNally's Easy To Read State Folded Map is a must-have for anyone traveling in and around Indiana, offering unbeatable accuracy and reliability at a great price. Our trusted cartography shows all Interstate, U.S., state, and county highways, along with clearly indicated parks, points of interest, airports, county boundaries, and streets. Includes inset city maps of Anderson, Bloomington, Elkhart, Evansville, Fort Wayne, Gary, Indianapolis, Downtown Indianapolis, Lafayette, Louisville, KY; Muncie, South Bend, and Terre Haute. Size is 28 x 40 inches unfolded. $5.99 62-6690 1 sheet, folded. Indiana Road Map - Laminated. Rand McNally. The durable, convenient Rand McNally Indiana EasyFinder® maps take all the wear and tear your journey can dish out. The laminated design allows you to mark your route, make notes, then wipe the surface clean for further use. Map size is 18 x 17 inched unfolded. $7.95 62-66902 1 sheet, folded. American Map. This map of Indiana State is durably laminated and contains extensive coverage. Laminated maps are easy to fold, write on, and wipe off. Coverage includes street-detail insets of: Evansville, Fort Wayne, Indianapolis, South Bend, and Terra Haute; and features: Airports, Indiana Facts and detailed information, Interstate Exit Numbers, Latitude and Longitude information, a Mileage Chart, National and State Parks, and Places of Interest. $9.99 62-66905 1 sheet, folded. Indiana City Maps. Various publishers. Folded, paper, city street maps. $5.95 62-6692BL Bloomington and Terre Haute City Map. (GM Johnson). Street map of Terre Haute with street index and selected points of interest, and insets of Vigo County and Indiana State University. Reverse has a map of Bloomington, IN, with insets of Monroe County and Indiana University, and a street index. $5.95 62-6692GA Gary & Hammond City Map. (GM Johnson). This full-color map covers Gary, Hammond, and surrounding communities. $6.99 62-6692I Indianapolis City Map. (Rand McNally). A detailed city street map of Indianapolis. $7.99 62-6692IND Indianapolis City Map. (American Map). This full-color street map of Indianapolis, IN includes: Beach Grove, Lawrence, Meridian Hills, and Speedway; and features: Airports, Block Numbers, Colleges and Universities, Golf Courses, Hospitals, Parks and Rec Areas, Places of Interest, Schools, and ZIP Codes. $6.99 62-6692INR Indianapolis & Region City Map. (Rand McNally). A regional road map covering Indianapolis and the surrounding region. $6.99 62-6692LAF Lafayette & West Lafayette City Map. (Warren Map). The Lafayette and West Lafayette, Indiana Street Map includes: Purdue & West Lafayette. Features Airports, Block Numbers, Colleges & Universities, Golf Courses, Government Buildings, Hospitals, Parks & Rec Areas, Places of Interest, Schools, Shopping Centers & ZIP Codes. $6.95 62-6692SOU South Bend & Elkhart City Map. 1:36,000. (GM Johnson). We offer wall maps for Anderson, Bloomington, Carmel, Elkhart, Evansville, Fishers, Fort Wayne, Gary, Greenwood, Hammond, Indianapolis, Kokomo, Lafayette, Muncie, Noblesville, South Bend, and Terre Haute. Sample detail from the Indianapolis wall map. We stock all USGS topographic maps of Indiana at all available scales. Indiana National Forest Maps. 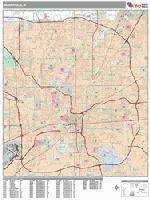 We stock the Hoosier National Forest map for Indiana. Click here for our complete National Forest Maps listing. Click here for the Hoosier National Forest Map. Click here for our Indiana fishing maps. Indiana has three long-distance trails that traverse the state - the Northern Tier Cycling Trail that goes east-west across Indiana; the North Lakes Cycling Trail that crosses the northeast corner of Indiana; and the Underground Railroad Cycling Trail that runs along the Indiana/Kentucky border. In addition, there are numerous "rail trails" and other popular rides throughout the state. Click here for our Indiana cycling maps & guides list. Indiana Recreation Maps. Trails Illustrated/National Geographic Maps. Detailed topographic hiking/canoe map showing trails, beaches, scenic view, campgrounds, and much more. Printed on waterproof, tear-resistant synthetic paper. Sample detail from the Hoosier N.P. map. $11.95 63-2100-770 Hoosier N. F. map. #770. 1:70,000 & 1:35,000. $11.95 63-2100-260 Ozark Scenic National Waterway map. #260. 1:63,360. Indiana Raven Shaded Relief Map. 1:500,000. Raven Maps. From Lake Michigan in the north to the Ohio River, Indiana is a state of subtle elevation changes marked by small lakes, low sandy hills, "knobs" or steeper hills, and limestone caves in the south created by underground streams. Elevations are represented by color, and this, in combination with our relief shading technique, gives the map a 3-dimensional look. Size is 29 x 44". Indiana State and County Wall Maps. Intelligent Direct. Thumbnail of the Indiana Premium style wall map. This style can have zip code boundaries. 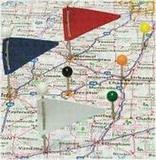 Thumbnail of the Indiana Color-Cast style wall map. This style cannot have zip code boundaries. Sampe detail of the Indiana Premium style wall map. This sample shows county boundaries, zip code boundaries and urban areas. Indiana Wall Map. 1:316,800 (approx.). Kappa Map Group. Map size is 50 x 62 inches. This map features color-coded counties, a laminated surface that is both markable and washable, and indexing on the face of the map. Details include all state and federal highways, cities and towns, major waterways, major airports, time zones, state universities, state parks, wildlife areas, military installations, police and state police posts, county names and boundaries, and points of interest. With plastic rods at top and bottom for easy hanging. Thumbnail of the Indiana wall map. $34.95 67-88747 1 sheet, flat. $3.95 62-1000IN Indiana flag, small. Size 4 x 6 in. $9.95 62-1001IN Indiana flag, medium. Size 8 x 12 in. $37.95 62-1003IN Indiana flag, large. Size 2 x 3 ft.